Feb 15 Recipe: Speckled Mocha Cake: A description of the methodological approach and the tastiness of the outcome. Subtle modification of the method described by Collister (2011) for producing Speckled Mocha Cake will result in a more moist and flavoursome dessert. 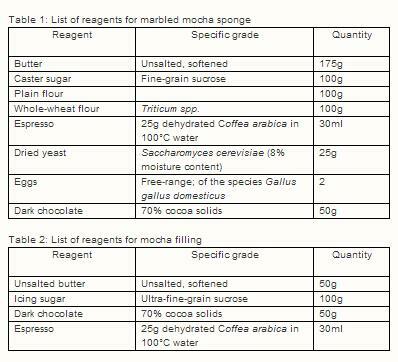 All reagent and solvents (Organic grade unless otherwise stated below) were purchased from Rema 1000 (Lørenskog, Norway). A fan-assisted electric oven was preheated to 180°C before preparation of the cake mixture. 175g of unsalted, softened butter was combined with 100g of caster sugar and homogenised with a wooden spoon. Three eggs, having been brought to room temperature (approximately 22°C), were added to the mixture and the homogenisation process repeated. In a plastic mixing bowl, 12.5g of dried yeast and 50g of fragmented dark chocolate were added to 100g of plain flour. This was then mixed with half of the butter mixture until it was established that all the reagents were homogenised. To the remaining half of the butter mixture, 12.5g of dried yeast, 100g of whole-wheat flour and 30ml of espresso were added before being homogenised, again ensuring that the mixture was fully blended. Aliquots of the plain flour and whole-wheat flour mixtures were dispersed evenly in a cake tin lined with supercalendered paper. The cake tin was spun for 30 seconds to aid removal of trapped air and stabilise the cake mix. The mixture was incubated at a constant temperature of 180°C for 20 minutes. Preparation of the mocha filling was completed in parallel with the incubation of the cake mixture. 50g of butter, 50g of fragmented dark chocolate and 30ml of espresso were mixed before being subjected to 30 seconds of dielectric heating at a frequency of 2.45 gigahertz (GHz) in a conventional home microwave. 100g of icing sugar was dissolved into chocolate mixture before being stored at 3°C until required. A sharp steel probe was used in periods of 180 seconds after 25 minutes of incubation to track the cooking process. The cake was determined as cooked at such time that the probe emerged from the cake in a dry state. The cake was removed from the cake tin, transferred to a wire rack and allowed to cool to room temperature. Once cooled, an incision was made through the middle of the cake across the x plane, dividing the cake in two. The mocha filling was spread across the lower segment of the cake and the cake reassembled. The method described above resulted in a moist, delicious cake, which demonstrated significant improvement on the methods described by Collister (2011, page 34) and thereby confirmed the hypothesis. The ability of the cake to retain its taste and texture for up to 5 days after storage in an air-tight container was a positive, if unexpected outcome. Whilst the cake was unanimously well-received, further work is needed to ensure incremental improvement of a method that is likely to become the procedure for producing delicious mocha-flavoured cake in the Patel household. Collister, L. (2011). The Great British Bake Off: How to Bake the Perfect Victoria Sponge and Other Baking Secrets. Wemding: BBC Books.